Hello everyone. I have a 1979 S2 9.2 C with Yanmar 2QM15. I am connecting a piece of Zinc hanging from a wire with an alligator clip on one side and zinc on the other side immersed in the water (the kind sold in West Marine) in order to protect from corrosion. Where should I clip it to on top side? On Boat next to me it’s connected to the back stay since on his engine, it ground through there. 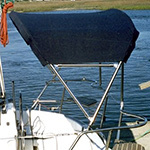 You need to make sure that the backstay has a GOOD connection to the ground for the boat. That MIGHT be okay, or you can better put a grounding terminal that is wired directly to what is the real "Ground" for the boat. Presumably that will be something connected throughout the boat by various conductors. Too often backstays aren't really connected very well. Thanks for the reply. How do i find the best ground point. Is it in the manual /wire schematic or I just need to look and follow the grounding point of the engine? One approach is to mount a terminal stud in a convenient place to connect from it with a wire directly to a gounded point. You then clip the Zinc Grouper, or block, to that and put in the water. I don't know if you S2 fans all the metal connected to the water bonded together. Anyway, I'd run the wire to a point on the engine where you have a common ground with the "rest of the boat". It's possible (but I doubt it) that your propeller shaft might have a vibration isolator that could break the continuity to the engine and leave the shat and prop "naked". If you are at a slip, by all means protect your boat and your life from stray current. But I never had an issue at a mooring. If I was at a slip I'd be checking the water around my boat with my multimeter all the time. And never swim off marina docks. Last year my Wife and I were at our favorite resort. We arrived and they had given us a double upgrade. We changed and got right in our private pool. My Wife started walking over to the far end (it is only about ten feet across and six feet wide and she, luckily, was waving her arms in the water in front of her as she did so. She complained that her arms were tingling and a grabbed her and pulled her back. We got out of the water and called maintenance. The pool pump ground had broken off from corrosion and the pumps outlet nozzle was shooting current across the pool at her. Luckily the pool was cement and there was no path to ground through her. I think the somewhat intermittent effect of the plum at distance helped too.